All Yoncalla homes currently listed for sale in Yoncalla as of 04/23/2019 are shown below. You can change the search criteria at any time by pressing the 'Change Search' button below. If you have any questions or you would like more information about any Yoncalla homes for sale or other Yoncalla real estate, please contact us and one of our knowledgeable Yoncalla REALTORS® would be pleased to assist you. "Fabulous property, shop, big barn, historic barn, solid home & screened in gazebo only a few miles off I-5. All usable land, perimeter & cross fence wood top rail & woven wire. 50' x 50' shop is insulated with 220, indoor RV hookups & dump, loft, 3 auto door openers and a full bathroom. Home has new roof & windows, floor covering & interior paint. Attached sunroom & 2 car garage, prolific spring, creek, large trees and amazing views." "Quiet country living in Yoncalla, yet less than 5 min to I-5. Well-maintained farmhouse with plenty of room for the family. Master on the main level. 2nd master upstairs plus 2 more big bedrooms. 3 & 1/2 baths. Country kitchen, wrap around covered porch, above ground pool. Hot tub negotiable. Plenty of parking for your RV or big trucks. City water & septic. Showing by apt only." "10 acres with fruit, nut, and trees, flowers and grapes. Several storage buildings and a chicken house. Fenced pastures perfect for horses, goats, chickens with lots of room for gardening. 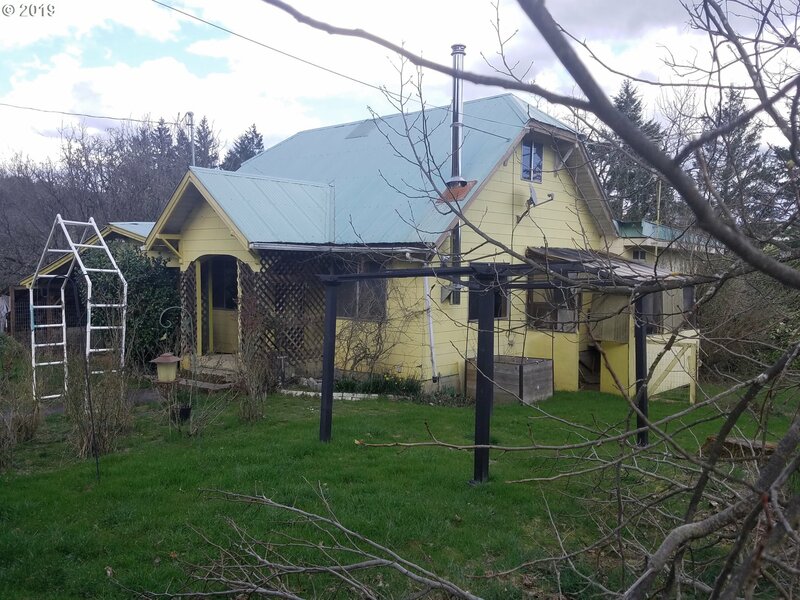 Your own little farm conveniently located near I-5 between Eugene and Roseburg. 3 bedroom, 1 bath home is solidly built with 624 Sq. ft basement, wood stove, greenhouse. Well plus year round spring that feeds a 2200 gravity flow storage tank." "You can't miss this extremely wonderfully maintained 2 story stick built home sitting graciously on a huge 1/4 acre lot. Features a fully fenced yard with a covered enclosed pagoda w/water & electric a detached garage & shop. Plenty of paved parking. Ductless heating. Public water and public sewer. Storm doors adorn each door, cozy kitchen with tile counters & wood cabinets, comfy pellet stove, RV Parking, ample decking & MORE!"